NASA’s latest Mars Science Laboratory (MSL), Curiosity completed the cruise phase of its journey between Earth and Mars, landing on the red planet in August of 2012. Yet, prior to touchdown, the public was able to watch the latest Mars rover perform its detailed mission months in advance of the MSL spacecraft landing via a breathtaking short animated film from Bohemian Grey Inc. 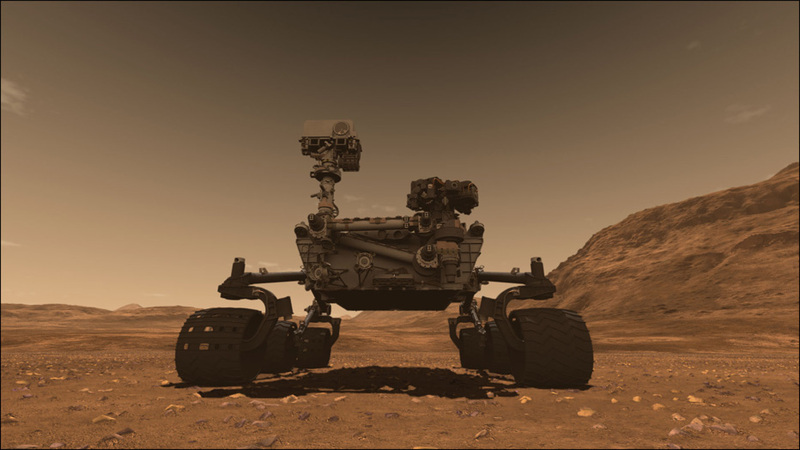 The Curiosity MSL’s mission—part of NASA’s Mars Exploration Program, designed to foster robotic exploration of the red planet—is to gather information intended to help scientists assess whether Mars is or ever was habitable, or capable of supporting microbial life. Bohemian Grey’s mission, also complex, was to make the best-looking short rover film possible to inform and excite the public. “These are exciting days for Mars exploration and JPL wanted the public to be a part of that excitement. This required that the mission to be depicted as truthfully and accurately as possible,” says Kevin Lane, founder and president of Bohemian Grey Inc. as well as director and animator on the Mars Science Laboratory animation project for NASA’s Jet Propulsion Laboratory (JPL). A division of the California Institute of Technology, JPL manages the Mars Science Laboratory mission for the NASA Science Mission Directorate in Washington. CG artists at Bohemian Grey use LightWave 3D to craft an impressive animated film for NASA’s Jet Propulsion Laboratory. Lane met with JPL officials and technical liaisons, committed Curiosity’s animated mission to a storyboard, and then guided the project through to its completion as an animated short film. A team of three artists at Bohemian Grey worked on the Mars Science Laboratory animation project from start to finish, with three others assisting at different times throughout production. “Considering we made the rover, which is a hugely complicated model, recreated the surface of Mars, and did nearly 17 minutes of animation, I think we pulled off no minor feat in just eight months,” Lane admits. Modeler Andrew Harlow built the intricate, true-to-life rover model. 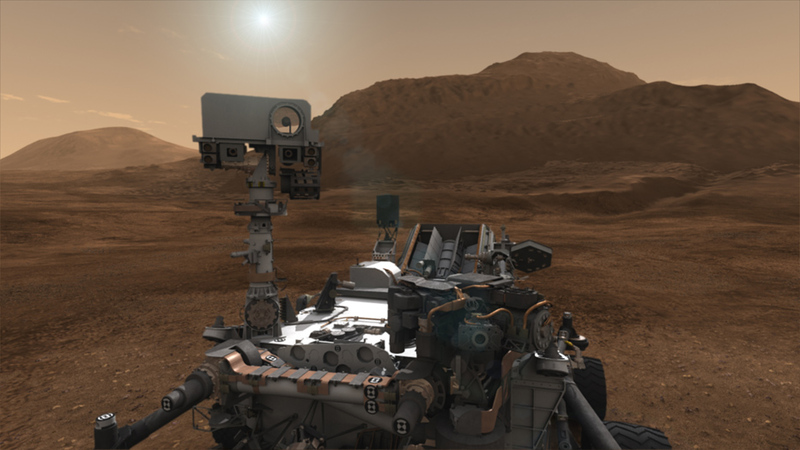 Computer graphics artists demonstrate the Curiosity rover’s mission on Mars well in advance of the actual event, which took place August 2012. The Bohemian Grey team constructed the animation in a rather atypical way. Based on Lane’s past experience with JPL, he knew they would use, reuse, and re-reuse the animation in dozens of ways and then hand it off to news agencies and networks, such as The Discovery Channel and The Science Channel, which would use it in different ways, as well. “From the beginning, I wanted to ensure it would have as long a shelf life as possible,” he says. So, the team approached virtually every shot and group of shots as though it would have to stand on its own. As a result, most of the shots in the film are actually longer than what is shown. 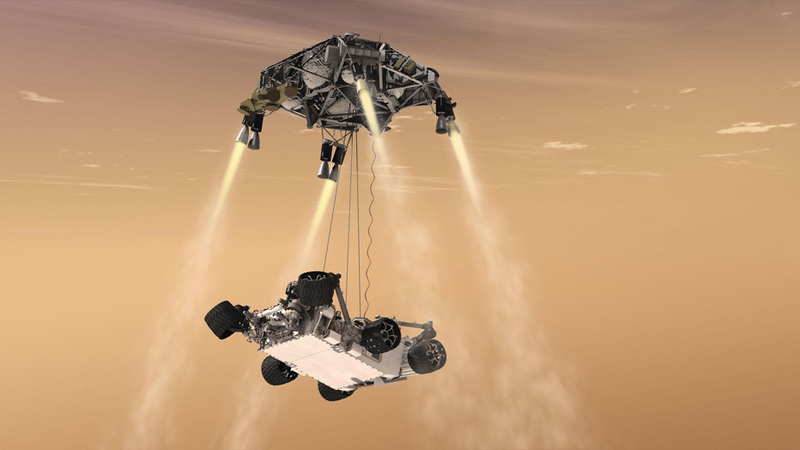 NASA's Curiosity rover is tucked inside the Mars Science Laboratory spacecraft's backshell as the craft descends on a parachute toward Mars. “In one shot, we are riding on the back of the rover as it goes down a hill. We used a portion for the film, but the shot was so fun, we just decided to render the whole thing,” Lane says. “Although that shot is only a few seconds long in the movie, the original render is roughly 3,000 frames long. “Under normal circumstances, you would never want to do more than is going to end up in the final product. But in this case, future use was a consideration, and we built it in wherever we could,” Lane adds. In total, 81 or 82 shots are used in the film. Bohemian Grey provided many more, but shots were inevitably changed, added, and removed as NASA and JPL were working to finalize the actual, future rover mission. Artists recreated the vast expanses of space in the digital realm, modeling two planets, roughly 10 environments, five vehicles, and a dozen or so effects elements such as rocket exhaust, the heated plasma of the atmospheric descent, and dust. “When a project has a severe deadline and lots of technical issues to hurdle, only LightWave can produce the final results in the time required without an army of artists and a massive render farm,” Arbanas adds. 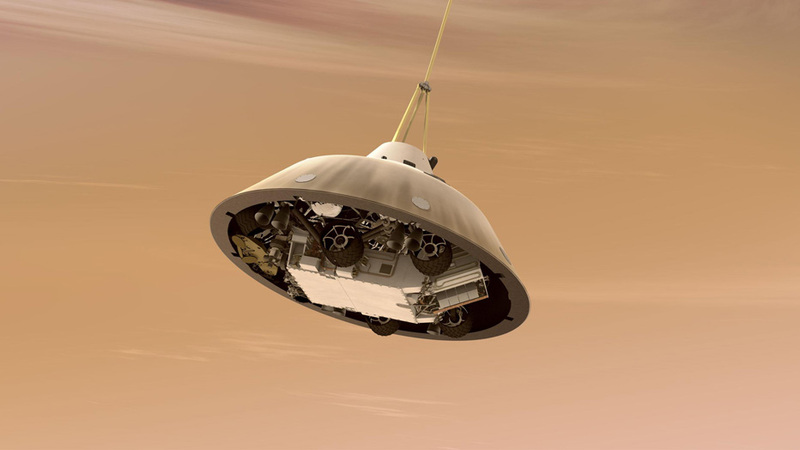 Bohemian Grey artists depict how NASA’s Mars Science Lab spacecraft will look like during its descent in the Martian atmosphere. Lane’s hand-drawn storyboards were turned into 2D animatics, after which the drawings were replaced with low-resolution 3D models and a simple animation for composition and pacing. The team used 3D Coat for compositing, texture painting, and some terrain sculpting. “I needed a way to sculpt and paint directly on to a terrain models,” Lane says. “3D Coat and LightWave seem to be kindred spirits and work together extremely well.” Everything else on the project was done in LightWave and went smoothly, with the exception of a single, heart-stopping glitch. NASA and JPL officials were hard at work building the real rover and deciding what the mission was going to be while Bohemian Grey artists were producing the animation. “It provided some of the biggest hurdles, but LightWave’s work flow allows for the easy replacement of models and motions—it really saved our bacon on more than one occasion,” Lane recalls with a laugh. At the very end of the film project, an engineer at JPL noticed a piece of equipment that was in the wrong place on the rover model. 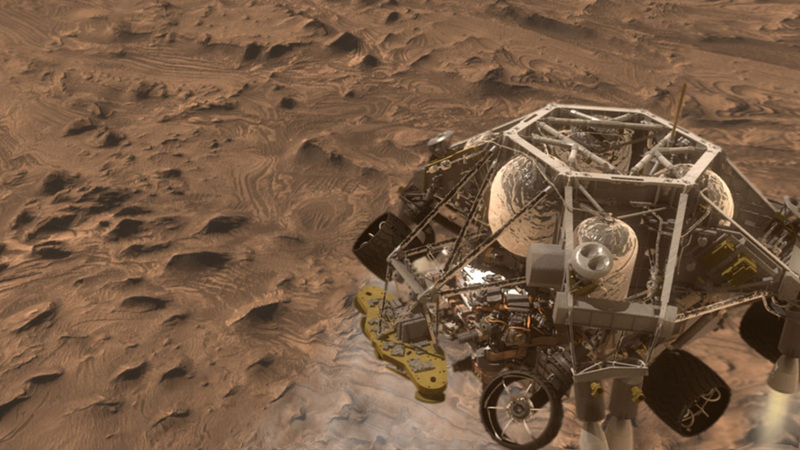 Artists had modeled the rover using reference material that “had something in a place it didn’t exist anymore,” Lane explains. “Given the complexity of the model and the fact that the real rover was still changing, it’s no wonder. But still, no one saw it ’til the very end, when the one guy that actually worked on that segment of the real rover happens to be looking at a pre-final version of the film and said, ‘Hey, what’s THAT doing there?’ A few heart attacks later, we fixed the rover, swapped out the model, and yes, re-rendered all the shots with the offending geometry. It was a caffeine-fueled triumph of man and technology over deadline and Murphy’s Law. NASA's Curiosity rover examines a rock on Mars with a set of tools at the end of its arm. Its drill can collect sample material from inside rocks, a scoop can pick up samples of soil, and the arm can sieve the samples and deliver fine powder to instruments inside the rover for thorough analysis. The Bohemian Grey team worked on Windows-based, 64-bit machines with Intel i7 CPUs and 16GB of RAM, accompanied by a 30-inch display and a prerequisite copy of Call of Duty: Modern Warfare, for after-hours stress relief, says Lane. The Bohemian Grey team relied on LightWave’s Viewport Preview Renderer (VPR), introduced in LightWave version 10, as part of the creative process. “When I had notes on a shot and needed to send a quick image or a preview to the client, the VPR made it possible to make changes and see them almost immediately. It’s a great way to make a client happy,” Lane acknowledges. 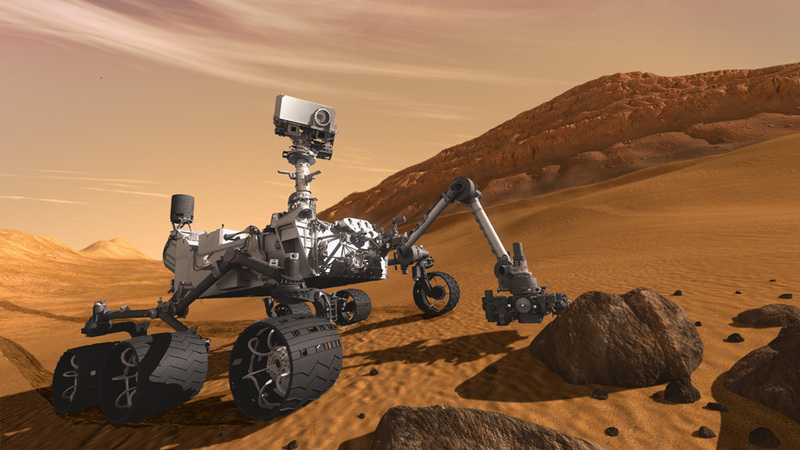 Artists at Bohemian Grey crafted a 3D model of the Curiosity in intricate detail as the real-world rover was still being built by NASA engineers. Lane counts the overall experience as a great success. “As projects go, this goes down as one of the really good ones,” he enthuses. “I am, without a doubt, going to continue to use LightWave, especially with the functionality coming in version 11. LightWave is poised to take the VFX community by surprise if they haven’t been keeping up on current events. I’m very excited about what’s coming.” The CGI and VFX communities are equally excited about what’s coming next, both from the LightWave 3D Group and Bohemian Grey. 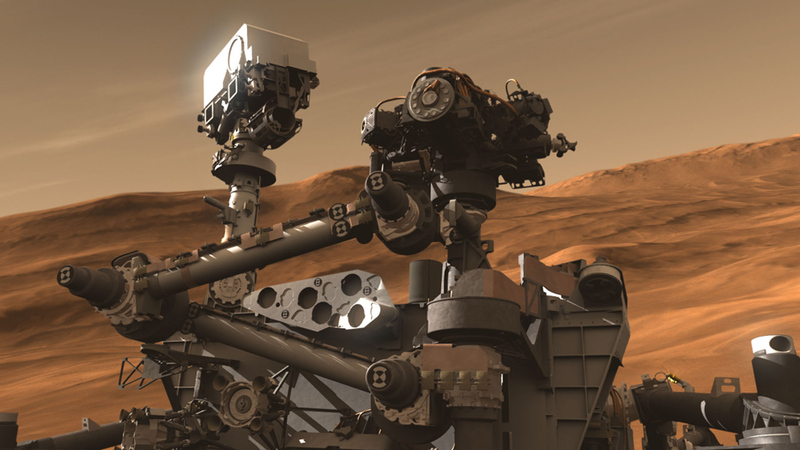 View the animated short film and follow Curiosity’s mission: on Facebook at http://www.facebook.com/marscuriosity or Twitter at http://www.twitter.com/marscuriosity, and online at http://www.youtube.com/watch?v=P4boyXQuUIw .